The Holgate facility in York provided Polysafe with an unusual challenge, which ultimately highlighted the flexibility and raw strength of the Polysafe system. 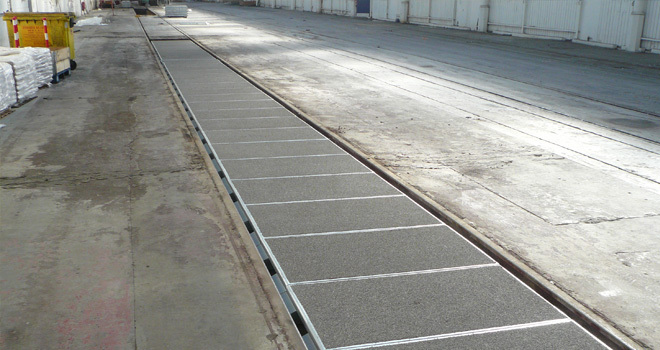 The facility is Network Rail's main depot for servicing and cleaning MPV modules. These multi-million pound vehicles are positioned over inspection pits to enable vital ongoing maintenance and cleaning to the chassis and rolling stock, with the modules being removed for separate maintenance. The modules can weigh over 10 tonnes, and are moved by a large forklift, itself weighing 10 tonnes. The problem was that the depot had steel covers on the inspection pits whenever an individual one was not in use. These would probably not have been capable of supporting the forklift weight alone, and certainly unable to support a combined forklift/module weight. Although the drivers were under strict instructions not to drive on the steel covers, turning circles were tight, and combined with reduced visibility when carrying a module, accidentally driving on the steel cover was always a risk. Clearly this could have led to a major safety incident and so the management at the facility decided to improve safety. The brief was to supply high strength covers that could easily be removed, would sit flush to the surface, leave a flangeway gap and integrate with an unknown rail type with differing fixing methods all at different spacings. In addition the cover had to be resistant to the cleaning acids used. The Polysafe panel system is high strength and is engineered to use the web of the rail for support in a 'bridge design'. This design never had never been used over a metre deep by 22 metre long pit despite having proven itself for over 30 years on the main rail network and the infrastructure in the depot was not to the same specification as the highly-maintained public rail crossings. Undeterred, Polysafe measured, designed and tested bespoke panels based on the same principles, giving an individual tailored solution to the problem. 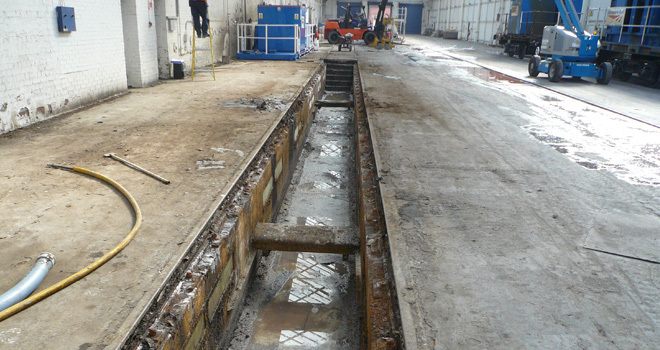 The solution has provided Network Rail with a a high-strength cover that enables much safer operation of this particular part of the depot, whilst helping to ensure the ongoing safety of the personnel.